How to restrict how far into the future a ticket transfer can be made, and if multiple transfers are allowed. You can impose restrictions on how far into the future a ticket transfer can be made and whether multiple transfers can be made of the same ticket. To find these options, navigate to Setup > Booking Options. Your restriction options are highlighted in the screenshot below (in red). Transfer window restriction. This is how far into the future a ticket can be transferred. For example, if we set this to 1 week and I had a ticket purchased on the 7th of January, the furthest I'd be able to transfer into the future would be the 14th January. The box to the right specifies the time on that day. E.g. at 2pm on 14th January. You can leave either box blank for there to be no restriction. Restrict to one transfer per ticket. This does what is says on the tin. 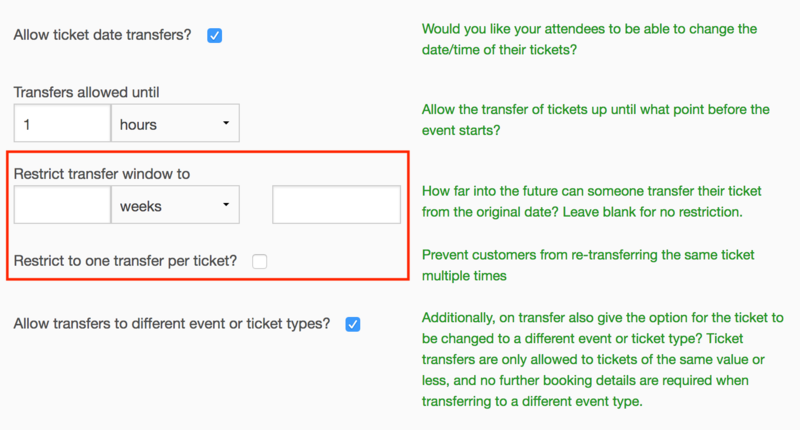 If you leave this box unticked then an attendee can transfer their ticket any number of times they wish. If the box is ticked they only get one transfer per ticket and that's it.